FQB "Lovin' Life" Collection will have you smiling and loving your life from the moment you open it up and begin to create! Brilliant colours and lively elements will take your creativity anywhere you want it to go!! Are you creating for a birthday or anniversary or are you capturing the memories and wonderful time you had on vacation this Summer....this will be the perfect digital kit for any of these uses. 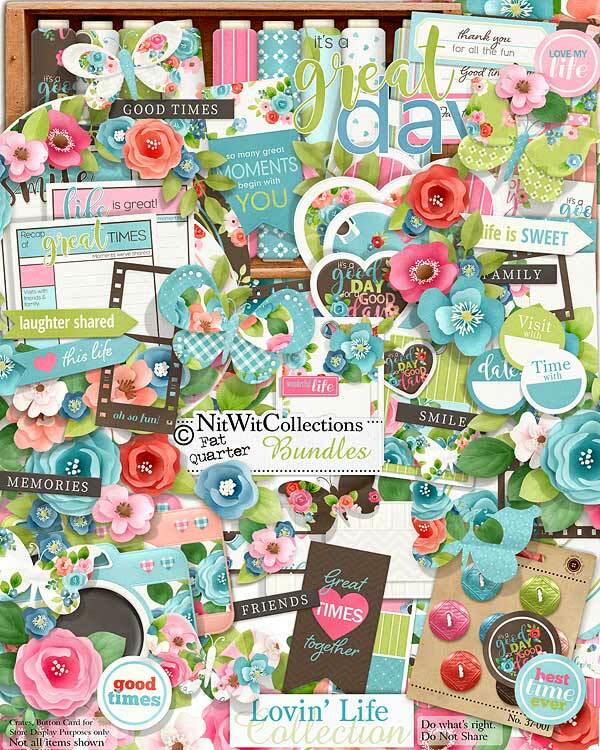 The floral elements, the hearts, butterflies and journal elements all work so perfectly together that creating with this kit is so easy, and will put a smile of your face. What or who makes your heart happy....your creative fun now awaits you! 1 Arrow - "Love this Life"
1 Arrow - "Life is Sweet"
1 Arrow - "Laughter Shared"
3 Arrows beautifully arranged and ready for your use in your scrapbook layouts, cards and mini albums! 1 Banner element - "Great Times Together"
1 Banner element - "So Many Great Moments...."
4 Branches of leaves, each in a different style and colour. Your creative options await you! 4 Colourful cameras....memories are made and let's share them to remember them! 1 Circle sticker - "Good Times"
1 Circle sticker - "Best Time Ever"
1 Circle sticker - "Love my Life"
1 Circle sticker - "It's a Good Day...."
1 Flower cluster complete with leaves....a true bouquet! 1 Frame in white to give you a smile slate to begin creating with....how do you see this embellished?? 4 Heart elements to show off the love you have! 1 Label - "Thank you for all of the Fun"
1 Label in a circular shape for a "Date"
4 Mat elements - some more simply arranged and some more elegant...which one speaks to you?? 1 Sentiment stamp - "Its a Great Day"
1 Wreath of flowers...the circle of life and creativity!